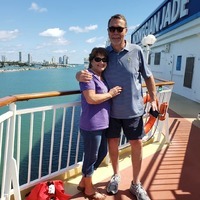 We booked this cruise as we wanted to do another Caribbean, winter escape, cruise. We really enjoyed our cruise a couple of years ago on the Pearl and wanted to sail her sister ship, Jade. Hadn&apos;t been to the southern, eastern Carib islands before so the itinerary was perfect. And it did not disappoint. Nor did the Jade. Embark went well, very efficient, no issues. Our cabin was on deck 8 ocean view pic window, 8624. Space and layout of these cabins are spacious and roomy. Bed very comfy, very nice pillows. Bathroom is very adequate, good space in shower with awesome water pressure. All in all the cabin has plenty of room for two, closet and drawer storage. Our cabin steward was stellar, thus so waupers the cleanliness and all things stateroom. Dining and food was very good. Dined in Cagneys twice, experience and food was good, however, not quite as good as two years ago on the Pearl. Other specialty venues that we dined were good, but not great. Honestly, the Grand Pacific was the best dining for food and service we experienced. It was super, great food, impressive menu, impeccable service. The entertainment in the pool areas on deck 12 & 13 in the afternoons was very fun, music always upbeat. Evening entertainment in the bars area at Magnums as well as the Atrium was beyond great. We didn&apos;t go to the shows in the Stardust theater because the music and entertainment in those other venus was so good. The guitar player that did the Neil Diamond tribute was outstanding. He was in the Atrium area, and it was packed, standing room only. Service ship wide was stellar. Crew, customer service, wait staff, all of them. Enjoyed all of the ports of call. Our time at San Juan was short, enjoyed a short tour of old San Juan and San Christobal. St. Thomas, we did the newly re-established Tree Limin&apos; Extreme Zip Line excursion. Great Fun! A must do if you like this sort of thing. Guides were super fun, very good about teaching safety and good technique so you could have a good experience. We traveled with a group of 10 friends. We are all in our 60s and had a ton of fun with this. St. Kitts is stunning. We did the Scenic rail tour. 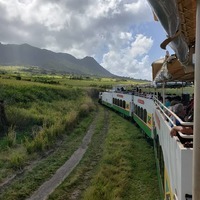 Very enjoyable, good culture and history of the island with this fun old train tour, not to mention some really good rum drinks served along the way. Barbados - we did the 4x4 and Harrison cave tour. I can not recommend this enough. The 4x4 specialty vehicle is a hoot as is the guide that drives it. Stops along the way are beautiful. Then you go to the Harrison Cave. Amazing. Ancient history. Truly a great experience. St. Lucia - didn&apos;t do a shore excursion here. St. Maarten - as with all of the other islands, St. Maarten is so beautiful. We did the Ultimate Explorer and Island tour. Part of the tour was on a nice air conditioned coach bus, the water part was on a catamaran boat called Explorer. Boat guys were a lot of fun, great tour of both sides of this island. More of those yummy rum drinks flowed freely. This island has made a lot of headway with repairs and recovery since the 2017 hurricanes, however, there is still a great deal of damage and destruction that is very visible, humbling. Truly a great cruise. Disembark was good. I think disembark is always a bit hectic. We did the Everglades airboat to MIA international airport tour after disembark in Miami. Good experience and tour. Guides give a great airboat ride! Learned a lot about the everglades we did not know. Look forward to the next NCL cruise. NCL Jade, great ship, even better cruise. We booked this cruise as we wanted to do another Caribbean, winter escape, cruise. We really enjoyed our cruise a couple of years ago on the Pearl and wanted to sail her sister ship, Jade. Hadn&apos;t been to the southern, eastern Carib islands before so the itinerary was perfect. And it did not disappoint. Nor did the Jade. Embark went well, very efficient, no issues. Our cabin was on deck 8 ocean view pic window, 8624. Space and layout of these cabins are spacious and roomy. Bed very comfy, very nice pillows. Bathroom is very adequate, good space in shower with awesome water pressure. All in all the cabin has plenty of room for two, closet and drawer storage. Our cabin steward was stellar, thus so waupers the cleanliness and all things stateroom. Dining and food was very good. Dined in Cagneys twice, experience and food was good, however, not quite as good as two years ago on the Pearl. Other specialty venues that we dined were good, but not great. Honestly, the Grand Pacific was the best dining for food and service we experienced. It was super, great food, impressive menu, impeccable service. The entertainment in the pool areas on deck 12 & 13 in the afternoons was very fun, music always upbeat. Evening entertainment in the bars area at Magnums as well as the Atrium was beyond great. We didn&apos;t go to the shows in the Stardust theater because the music and entertainment in those other venus was so good. The guitar player that did the Neil Diamond tribute was outstanding. He was in the Atrium area, and it was packed, standing room only. Service ship wide was stellar. Crew, customer service, wait staff, all of them. Enjoyed all of the ports of call. Our time at San Juan was short, enjoyed a short tour of old San Juan and San Christobal. St. Thomas, we did the newly re-established Tree Limin&apos; Extreme Zip Line excursion. Great Fun! A must do if you like this sort of thing. Guides were super fun, very good about teaching safety and good technique so you could have a good experience. We traveled with a group of 10 friends. We are all in our 60s and had a ton of fun with this. St. Kitts is stunning. We did the Scenic rail tour. Very enjoyable, good culture and history of the island with this fun old train tour, not to mention some really good rum drinks served along the way. Barbados - we did the 4x4 and Harrison cave tour. I can not recommend this enough. The 4x4 specialty vehicle is a hoot as is the guide that drives it. Stops along the way are beautiful. Then you go to the Harrison Cave. Amazing. Ancient history. Truly a great experience. St. Lucia - didn&apos;t do a shore excursion here. St. Maarten - as with all of the other islands, St. Maarten is so beautiful. We did the Ultimate Explorer and Island tour. Part of the tour was on a nice air conditioned coach bus, the water part was on a catamaran boat called Explorer. Boat guys were a lot of fun, great tour of both sides of this island. More of those yummy rum drinks flowed freely. This island has made a lot of headway with repairs and recovery since the 2017 hurricanes, however, there is still a great deal of damage and destruction that is very visible, humbling. Truly a great cruise. Disembark was good. I think disembark is always a bit hectic. We did the Everglades airboat to MIA international airport tour after disembark in Miami. Good experience and tour. Guides give a great airboat ride! Learned a lot about the everglades we did not know. Look forward to the next NCL cruise.